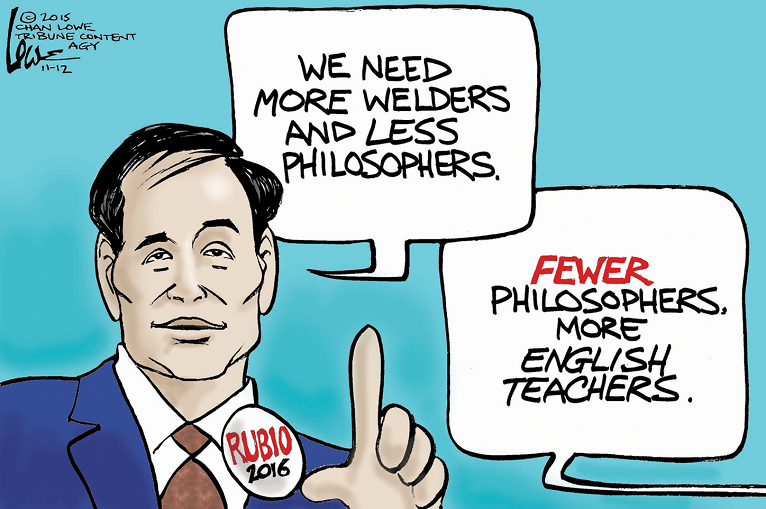 “Welders make more money than philosophers,” Marco Rubio said in a recent G.O.P. debate. “We need more welders and less philosophers,” he continued, proudly. It was a decent line from the presidential hopeful. But not long after these words echoed around the Milwaukee Theatre, it was shown to be a somewhat clumsy statement, not least when seen alongside figures from the Bureau of Labor Statistics (comparative wages: philosophers & welders). Thus over the days following Rubio’s line, it was caricatured, with one cartoonist picking up on Rubio’s wording. This G.O.P. presidential candidate is not alone: All of the 2016 presidential candidates, Democrat and Republican, have been caricatured. So, too, are their worldwide equivalents on a regular basis. Why? It’s simple: Political cartoons are a powerful thing. They play an invaluable role in shaping public opinion and, by extension, the political culture we live in. But the power of an image isn’t a new development; on the contrary, images were arguably more important in the eighteenth century than they are now. 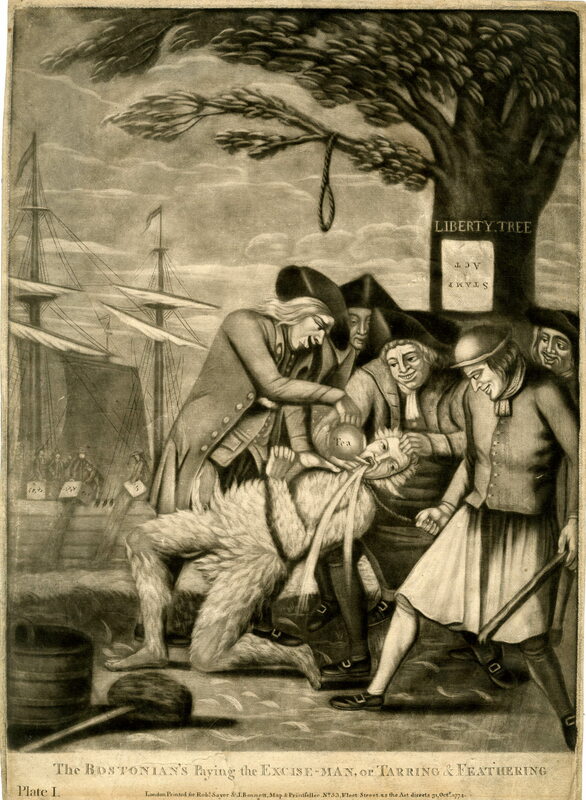 Indeed, in eighteenth-century Britain, caricaturists used images to shape Britons’ opinions of colonial British America, and the people who lived there. “A new method of macarony making, as practised at Boston,” , © The Trustees of the British Museum. The long eighteenth century in Britain was the heyday of satirical caricatures. The majority of them were related to political events. Yet, for the most part and like British perspectives more generally, caricaturists’ work is often overlooked. Few historians of early American incorporate Fleet Street’s productions. At one stage, problems of accessibility could be used to account for their neglect. Unless you went to a major research institution—the British Library, British Museum, the John Carter Brown Library, or the Library of Congress, for instance—it was difficult to look at these images. But this is no longer the case. Many are available via microfilm and, even better, thousands of images are digitally available for download and analysis. Early Americanists need to use these resources not only in the classroom but in his or her own scholarship, as well. Political caricatures produced between ca. 1765 and 1783 provide an invaluable insight into British perspectives on various crises in colonial British America. As I have written elsewhere, British perspectives must be incorporated into scholarship on the American Revolution. Doing so will broaden and enrich the field. And, I think, using eighteenth-century caricatures from the British press will tell us a great deal about the development of print culture not just in colonial North America but in the British Atlantic world. Every part of a caricature was chosen, carefully. Everything and everyone represented was included to make a point. These political cartoons were designed with precision, and Britons consumed them, hungrily. Around 3,000 prints appeared between 1730 and 1760; about 6,000 appeared between 1770 and 1800. And in the years leading up to the American Revolution between 6 and 10 appeared each week. Benjamin Wilson, “The Repeal, Or The Funeral Of Miss Ame-Stamp,” 1766, © The Trustees of the British Museum. To be sure, cartoon consumption cannot be held alongside that of newspapers. But they were a definite part of Britain’s political culture. In urban hubs, like London, Britons very much enjoyed looking at cartoons on American issues. 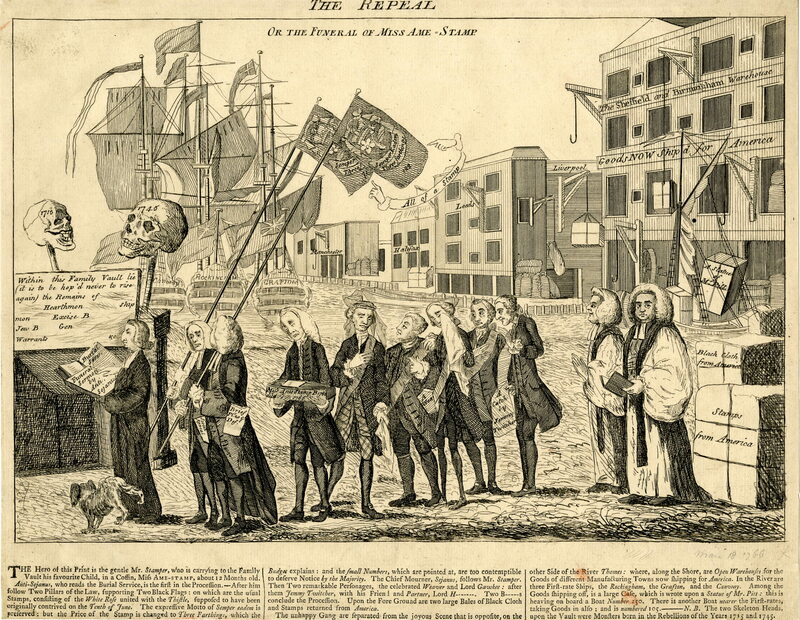 It has been suggested that Benjamin Wilson’s Stamp Act-related cartoon, shown here, sold up to 16,000 copies in 1766. Wilson’s cartoon went viral; Most sold around 500 copies, with more-popular cartoons selling around 1,500 copies. “Liberty triumphant, or, The downfall of oppression,” 1775, The Miriam and Ira D. Wallach Division of Art, Prints and Photographs: Print Collection, The New York Public Library. But why have cartoons been overlooked? One is reason, perhaps, is that few prints were produced in the colonies prior to the American Revolution. 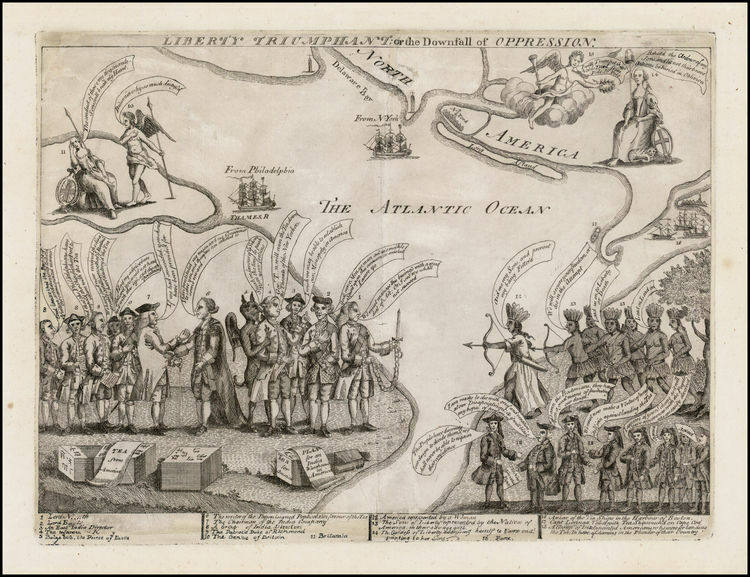 Some were of course; most famously by Paul Revere, but also Henry Dawkins’s New York-focussed Liberty Triumphant: or the Downfall of Oppression, shown here. Nevertheless, it wasn’t until the 1790s when cartoons became a regular feature of America’s political lexicon. For example, the cover of Joanne Freeman’s Affairs of Honor is a wonderful modern rendering of an early republic political cartoon. 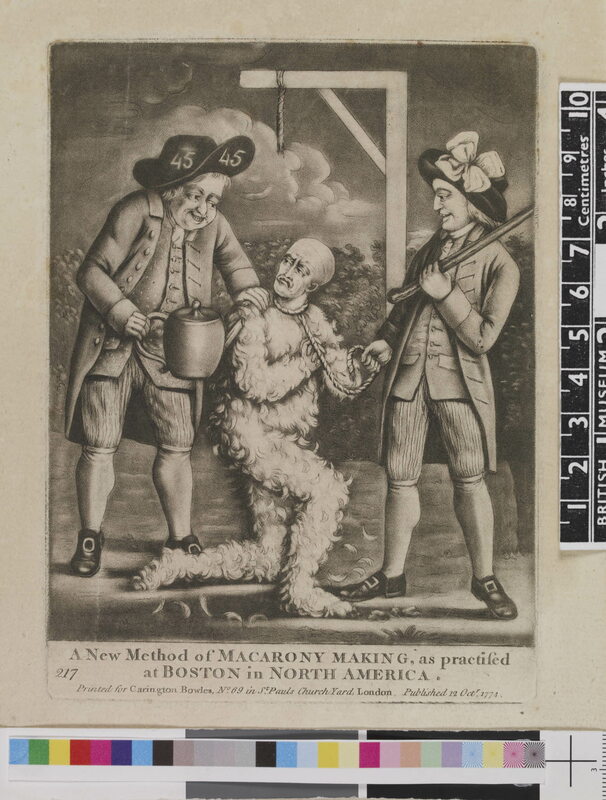 “The Bostonian’s Paying the Excise-man, or Tarring & Feathering,” 1774, © The Trustees of the British Museum. Equally important, these sources are fantastic teaching tools. Spending an entire class dedicated to exploring one to three images can be extremely beneficial. In classes I have taught at the University of Edinburgh, the University of Stirling, and The New School, I found that students very much enjoyed analyzing the prints of James Gillray, or any other caricaturist for that matter. I found caricatures to be particularly effective in small-group situations, when each group had to breakdown a print. And by asking students to find the images themselves, through an online database, it can develop their digital literacy skills, which will, hopefully, help them in the long run. Another reason, I think, why students are so fond of caricature-based work is that they are still relevant. Today, as Democrat and G.O.P. presidential hopefuls are vying for their respective nominations, caricatures appear on a daily basis. People are caricatured each week in The New Yorker, while, in Britain, Private Eye is well-known for its satirical drawings. More important, though, political images still influence public opinion. And by looking at Britain’s caricatures on the American Revolutionary Era, however it is defined or periodized, historians will add further detail to our understanding of early American history.